Burt’s Bees is one of my favourite companies for a couple of reasons. One of them is that their products are free of nasty chemicals and synthetic ingredients, another is that they are natural and the biggest reason of all, Burt’s Bees products rock and do the job they are meant to do! They have a huge array of products from Baby Care to Hair Care to Body Care and more. There is just so many wonderful things to choose from. I got to try out three products from Burt’s Bees that help different areas- one for the body, one for skincare and one for the lips. 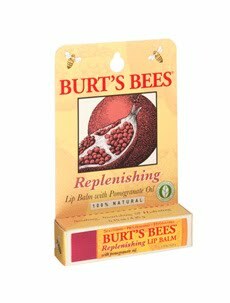 Burt’s Bees is best known for its natural lip balms. In fact, I think that is the first product of theirs that I tried many moons ago. I was excited to try out their newest product for lip care called Replenishing Lip Balm with Pomegranate Oil. It is made with antioxidant rich Pomegranate Oil to both replenish and rejuvenate your lips. It did not disappoint me at all. It goes on smoothly and keeps my lips hydrated and feeling great. I like that it does have a bit of gloss to it so that you don’t even need to wear lipstick. This lip balm will do the job. It has a nice scent (and yes, it tastes good- not like some lip balms that look good but taste yuck!). Its a keeper. It costs $4.49 for a .15oz tube. 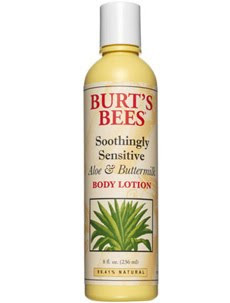 Burt’s Bees has introduced some new body lotions that are full of nature’s most healing ingredients. I tried the Soothingly Sensitive Aloe & Buttermilk Body Lotion. It is meant to soothe dry and tired skin and is perfect for those of us with sensitive skin (like me!) I use it after my shower and like how my skin drinks it up and leaves it feeling soft. There isn’t really much of a scent (again probably because it is for sensitive skin). It works great on razor burn! It costs $14.99 for an 8 fl.oz bottle. Last but certainly not least, I tried out a product from Burt’s Bees Naturally Ageless Collection which is their new line designed to fight aging naturally (the Burt’s Bees way!). These products are designed to reduce lines and wrinkles and improve the firmness of your skin with the help of the powerful antioxidant pomegranate. It does not contain Dimethicone (a health harming contaminant) which is in many other anti-aging products. 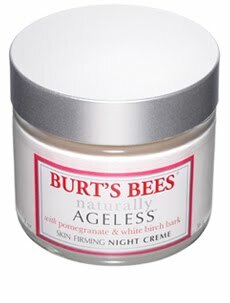 The one I tried is Burt’s Bees Naturally Ageless Firming Night Cream. This product is meant to fit the signs of aging while you sleep and restores skin firmness and keeps it hydrated. 78% of women who tried it reported that their skin felt firmer after just four weeks of use! I loved the fresh smell of pomegranates (one of my favourite fruits) so it was a treat to my skin to apply this luxurious cream. It did make my skin feel firmer although my skin doesn’t need that much hydration (I am still really oily). It would be wonderful for my mom to use as she has dry skin. I love that it is natural though and as my skin loses its oiliness as I age, I will definitely want to come back and try this particular product again. It retails for $39.99 for a 60 ml jar.